We have never been kite fishing before, we have watched others putting out kites but were unaware of the intricacies of this type of fishing. Kites are an effective way of getting a long line out from the shore to deeper waters, there is of course the torpedo/electric Kontiki option but that starts adding up the $$$’s – something we cannot justify as yet. Perhaps after winning Lotto this weekend??!! 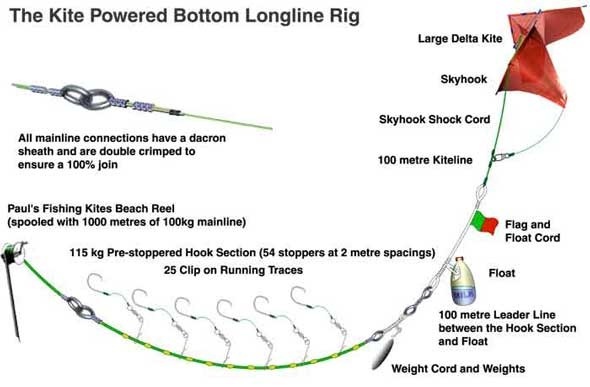 The following is a diagram of how kite fishing works, copied from Paul’s kite Fishing web site. Jim has a selection of kites with all the associated gear required, so our first trial was off Matai Bay with a good offshore breeze making it for a good day to have ago. Off down the beach we trotted with all our gear in tow, and with only a couple of trips to return to the vehicles to pick up forgotten bits, we settled down to sorting ourselves out. 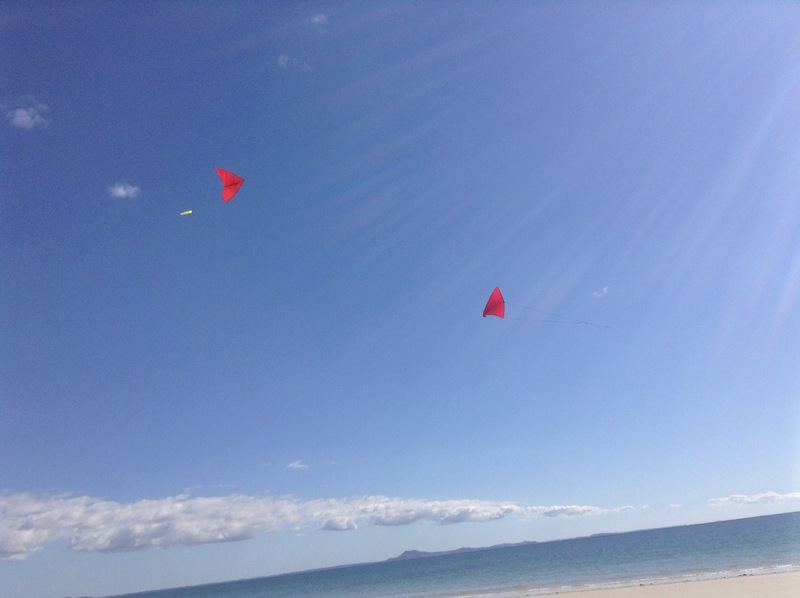 After many trials with various setups, different kites, secondary kites (called sky hooks! ), we got the line out in what we thought was the right spot, in the middle of the bay, and then we waited. After about an hour we hauled the line in bagging ourselves a reasonable sized snapper, guess what’s for dinner? Not trusting their fishing/catching skills, I had taken some steak out of the freezer for dinner, however, to prove me wrong, they came home triumphant with 4 very good sized snapper. Plenty enough for us for dinner for a few nights. Since then we have been out a couple more times, chasing the wind on some occasions. 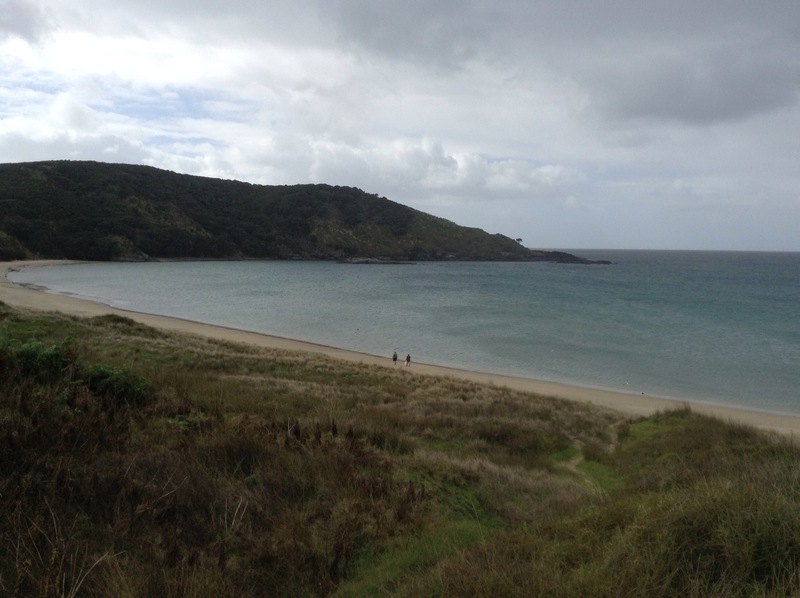 We went to Karikari Beach as we thought the wind was offshore there, only to arrive to a wind change, so off down to Rangiputa where again it was the wrong wind direction. Next it was over to Tokerau Beach where not only had the wind changed direction again but the damn wind had dropped off completely so no kite flying that day. 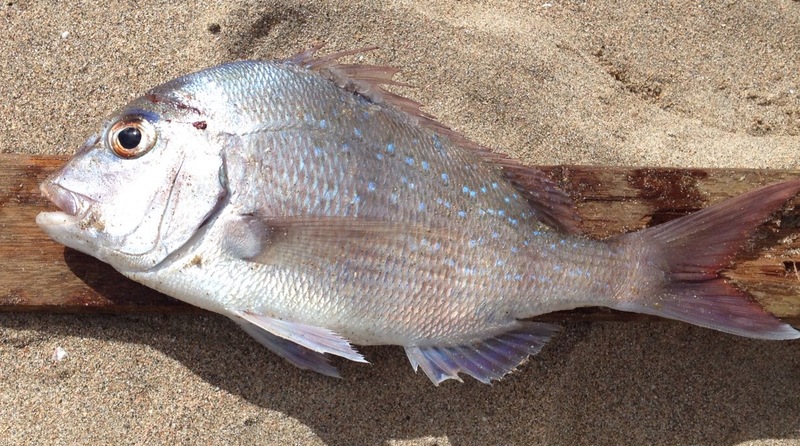 Never mind, we still had plenty of fish left from the previous days fishing. Jim went out fishing one afternoon with some locals who were keen to pass on their skills at kite fishing, although they ended up not using a kite but a Kontiki, the principle is the same. Not only did he gain a little more knowledge of the ins & outs of rigs, He came home with a good catch of lovely sized snapper to fill the freezer. 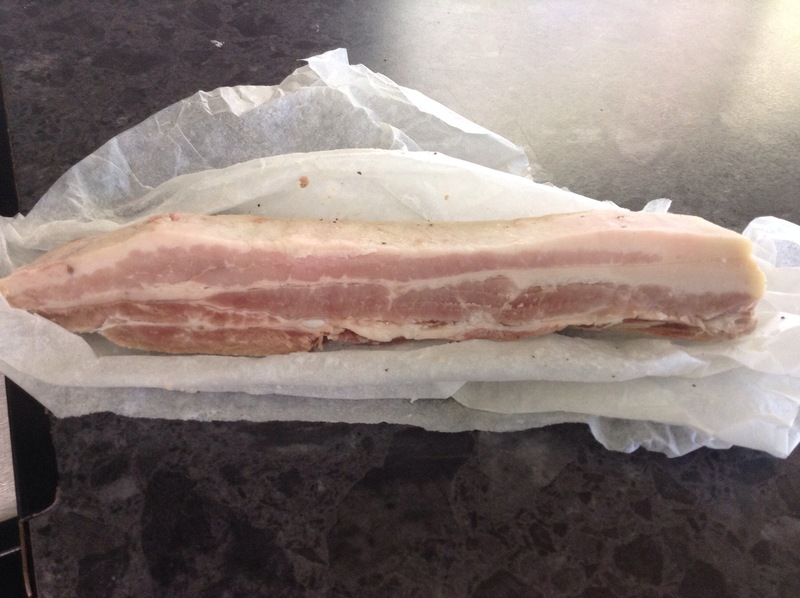 Meanwhile, we have been bringing home the bacon, literally, as we have had a go at making our own bacon, the first attempt was completed this week and has been a huge success. 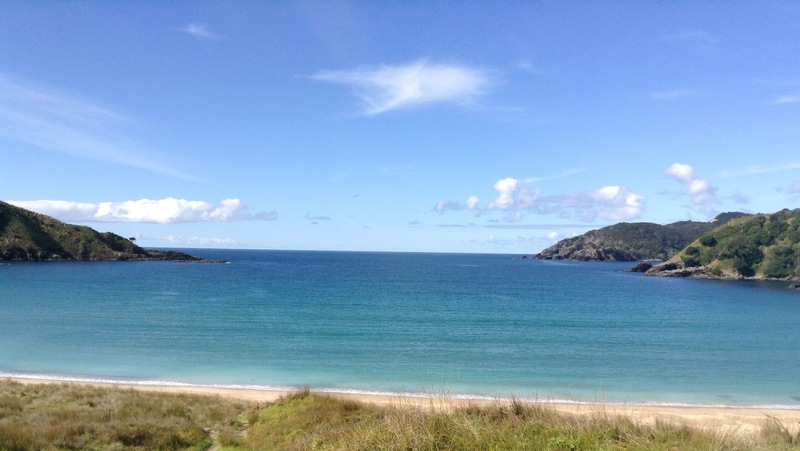 Before I get onto the delights of Matai Bay, I must apologise for my last post, particularly to all whose eyes glazed over and yawned at my boring explanations of the joys of voice activation of an iPad. Mind you, a few people have actually tried it – and it worked! 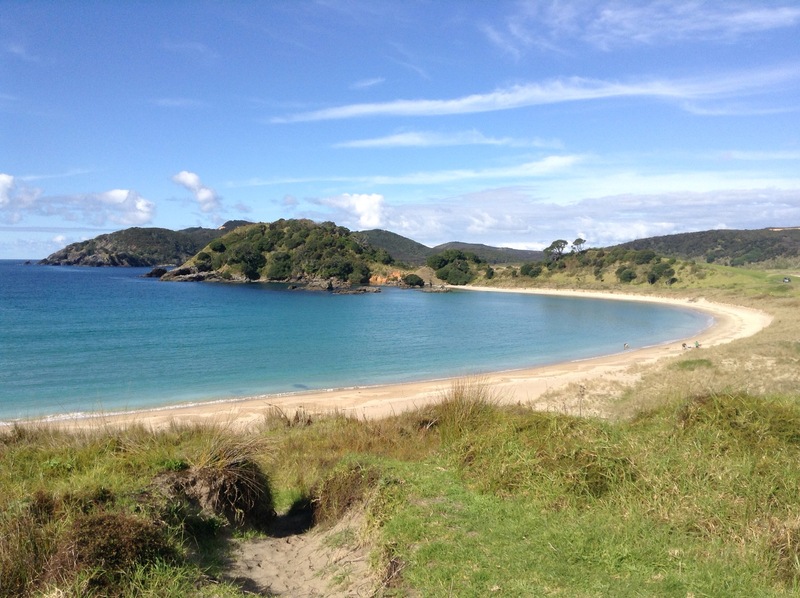 We arrived at Matai Bay last week, it must be one of our favourite places to stay. Athough this time we are not parked in (my) favourite part of the site as the ground was a bit boggy in places. Never mind, we have a great spot with views straight out over the bay. who could complain of this view from our bedroom window? 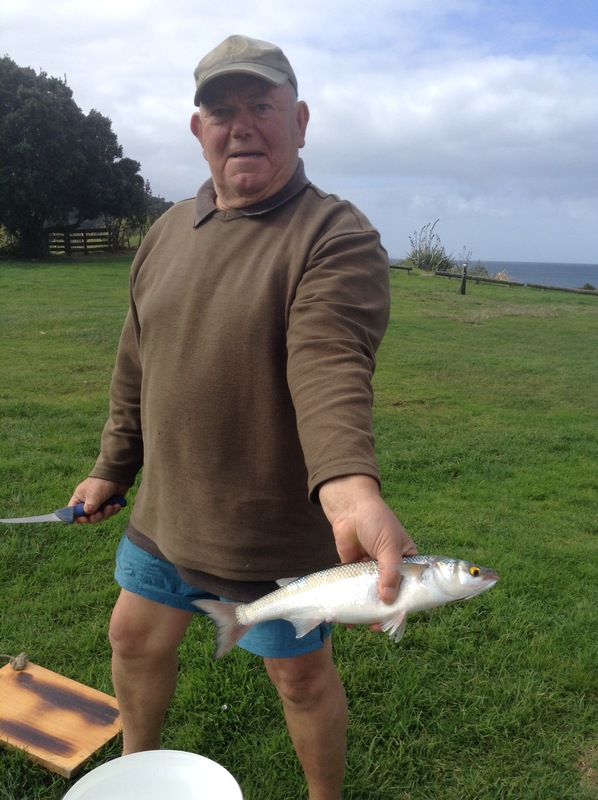 Jim & Judy joined us after a few days, and it wasn’t too long before Jim, being the ever keen fisherman, had dragged Roy off to set the net in the bay to try out their luck. They set the net the first day, here they are down on the beach debating when to pick up the net. All that was caught (apart from a bit of weed) was one grey mullet. Jim with the catch of the day. Another day and Jim tried out his kites for kite fishing. 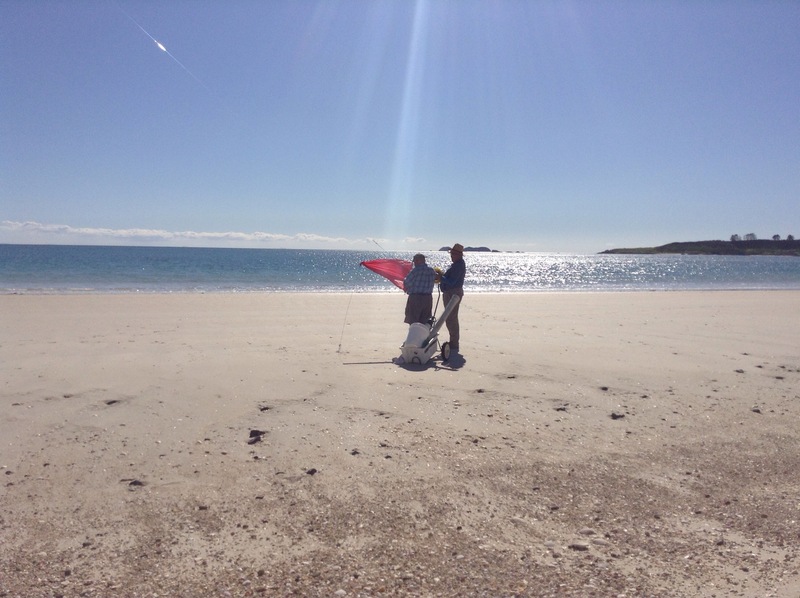 There were the different types of kites that he had with him, and differing lines, hooks and set up so much time was spent trialling the different methods. However, the end result was no fish. Another day and Jim went off to see some other fishermen who were sending out a torpedo. After spending much of the day with them learning the ins and outs of this type of fishing, he came back with a snapper for his efforts and a promise to go out with them again tomorrow. We have had our awning out and the windbreaks up, which provided us with a lovely space to sit out of the breeze. Then the wind direction changed and for the first time since we got the windbreaks, we set it up at the opposite end of the awning toward the rear of the van. 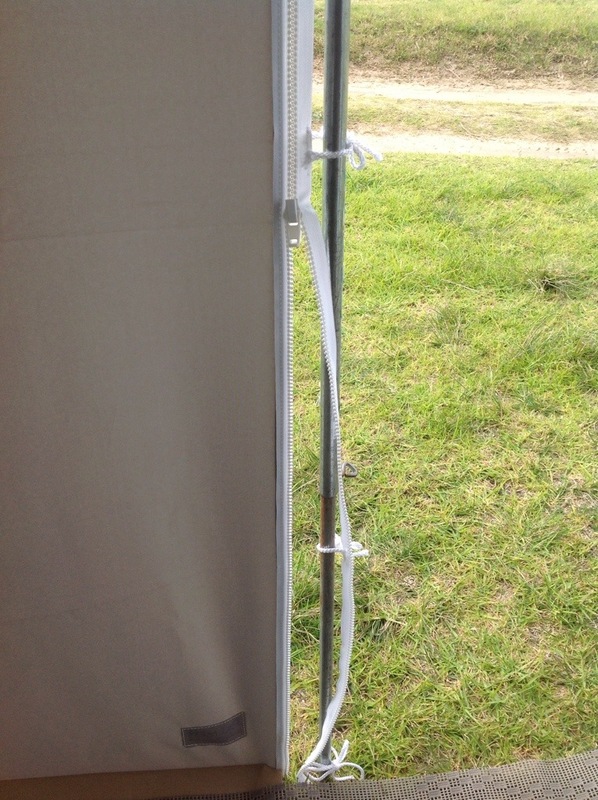 We can report that it all works well, although another hole had to be drilled into the awning roll to accommodate the end strengthening pole for the set up at this end of the van. Angela visiting, we look forward to meeting you again on the road soon. Brian & Marj joined us when we were parked at the RSA in Kaitaia and it was here that they asked if we could assist them with a computer problem. They had purchased a new iPad so that Marj would be able to listen to audio books – as she has a degenerative eye disease and can no longer read. They were having some issues with an App they had downloaded which supposedly enabled a book to be read aloud. Whilst looking at their issue and trying to resolve it, we stumbled across the perfect answer, and who would have guessed that it is already a feature of the iPad? iPads come with an Accessibility function, which once you delve into it, it has all sorts of features from; Voice functions – size, boldness, contrast, reduce motion, read aloud functions etc for the sight impaired, to hearing functions- subtitling and captioning , and even touch sensitivity, click speeds etc for those who need to tweak this feature. At the very bottom of the accessibility page you will see Accessibilty Shortcut button, turn this on and when you click the Home button three times it will automatically start the Voice Over Function when you need it. Within the Voice Over function you can increase or decrease the speaking rate (I find 15-17% about right), and then choose the language & dialect you prefer, I hate to say it but I find the Australian English easiest on the ear!! There are lots of settings you can play with to alter to suit your needs. There is even a Braille function – not that I have tried that one yet! Once you have all you settings sorted, triple click the Home button to start Voice over, highlight the item you want with a single tap, i.e. If you want to open a book in your books folder, double tap to open (the voice over function will tell you what to do), then tap the app you wish to open eg iBooks, double tap to open, single tap the book you wish to read to highlight it, then double tap to open, tap on the sentence you wish to start reading then with two fingers swipe downwards for it to commence reading the page from that sentence on. You are now underway. You can use this function for reading your emails, even this blog entry! To turn off the Voice over, triple click the Home button again. This works with all versions of the iPad. We have iPad versions 1 & 3 and the latest mini iPad, with all of these having the Accessibility function. I am now enjoying reading my books through my headphones whilst I knit. It takes a little to get used to the voice and of course you do not get the intonations and character individuality but it does not take long to get used to it and for a change it is rather fun and I like being able to do two things at once. Of course for those who really need this function, it must be brilliant and make life so much easier. We have always enjoyed listening to books. Especially when the kids were young we used to always have a book or three on cassette tape to play in the car on long journeys, we were even known to drive around the block a few times on reaching out destination to finish off a book! Cassettes then became CD’s (all usually borrowed from the local library), and we then progressed to mp3’s of various programmes. Before venturing on trips around the country Roy & I would have a few books or interesting programmes to listen to in the car – saves on inane conversation!!!! Now we have a new toy to play with. So thank you Brian & Marg for asking the question and we hope you enjoy reading lots of books Marj. We are heading northwards, but first a bit of a catchup on things missed from the last entry. 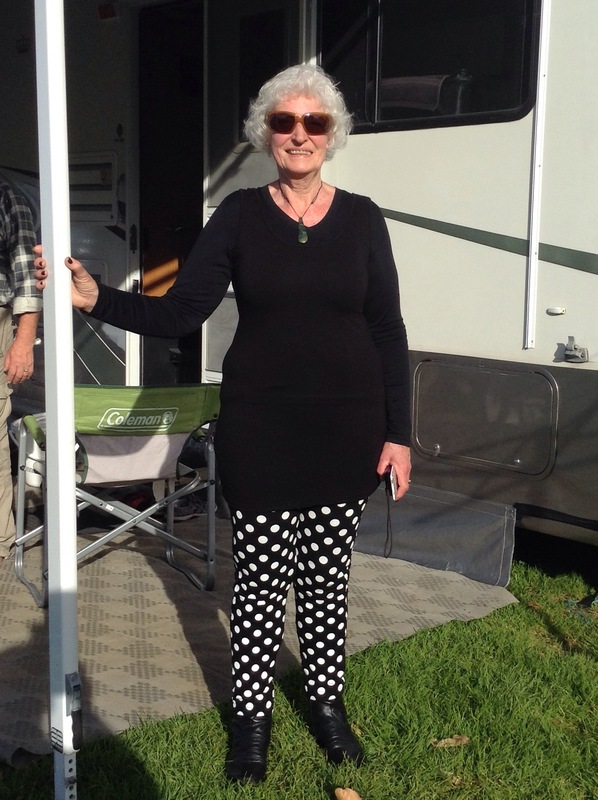 Whilst in Kerikeri, we caught up with Mieke & Graham Apps. Many years ago Graham worked for Roy at Kinleith, and Mieke is a renown fabric artist, weaver, quilter and general very clever lady – you can see some of her work and hand dyed fabrics here. We spent a lovely afternoon catching up with all their news and renewing old friendships, we will definitely catch up again next time we are in Kerikeri. 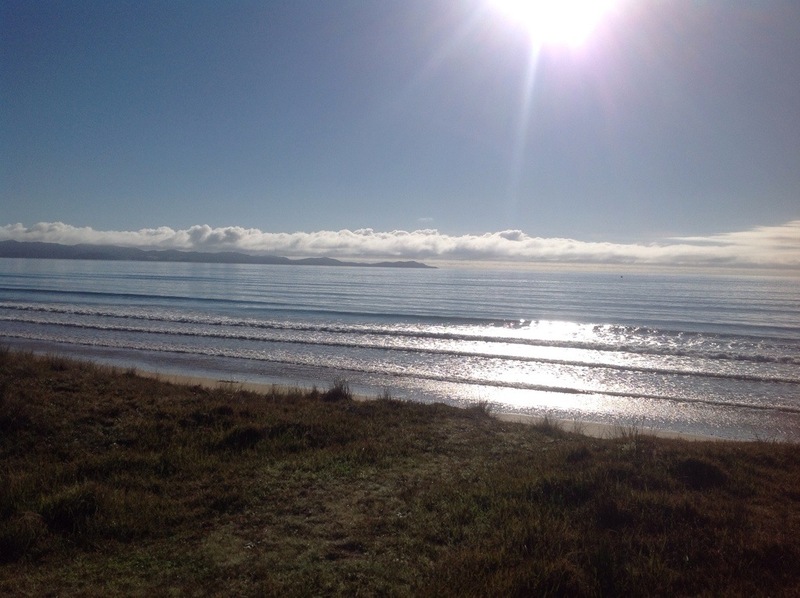 We stayed at Tokerau Beach for nearly 2 weeks, enjoying the views, the weather and the company. Jim & Judy came and went, Brian & Marj came to stay for a while and we enjoyed their company for many a happy hour. Brian & Marj were the ones who introduced us to the idea of Sunday Brunches – to remind them that it is the end of the week and tomorrow is Monday, with this lifestyle we tend to lose track of days so a Sunday Brunch is a good reminder of the day of the week. So it was lovely to be invited to their bus last week for Sunday brunch – and what an amazing repast awaited us. 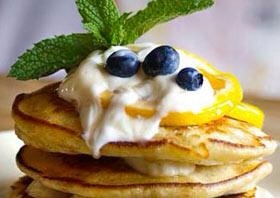 Pancakes, crispy bacon, grilled banana, caramelised orange slices, blueberries, maple syrup and homemade deliciously thick yoghurt. a feast to set us up for the day. We were running low on water and with little rain due, we decided to head off into Kaitaia on Wednesday. But wouldn’t you know it? In packing up I dropped my iPad, it hit the corner of the metal table leg and cracked the screen. Oh no, what am I to do? Luckily the break is mainly in one corner so I can still use it for reading, although a crack has started to appear across the main part of the screen. Thursday I drove from Kaitaia back to Kerikeri to see about getting a replacement screen. The first sales assistant at the Noel Leeming store told me yes, they could get the screen replaced but it would have to be sent away and would cost approximately $290 plus postage, plus, plus, plus…..so I decided to treat myself to a new iPad but this time a mini iPad, much better for reading as it is much lighter and easier to hold. I chose the iPad, and a cover and was talking to another sales assistant who then informed me of someone local he knew who does the screen replacement for around $130! A quick phone call and yes, she could replace the screen but not until next week. I went ahead with my purchase anyway and will get the old one fixed so either Roy or Antony can inherit it. In the meantime, I am transferring all my books and other data from one machine to the other and enjoying the novelty of a new toy. 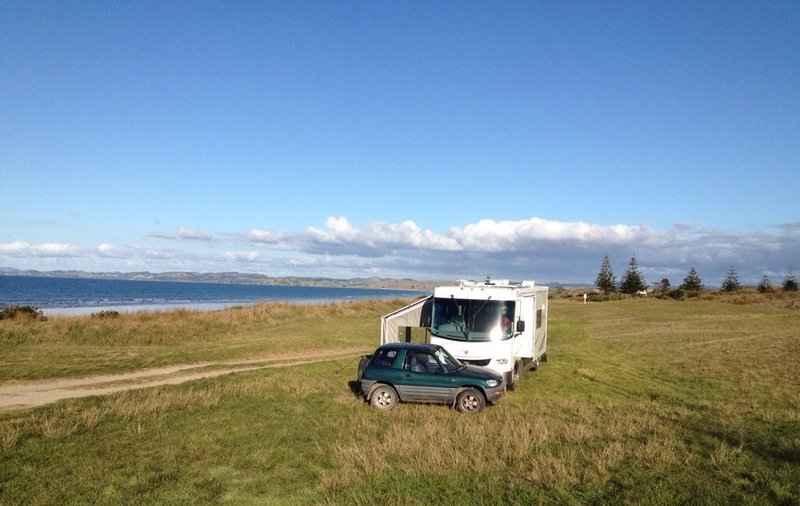 We are parked at the RSA in Kaitaia, a large flat parking area close to town and all the amenities we could possibly need. We are making full use of the local library with its free wifi, and I can highly recommend the coffee at the library cafe! We have ordered a new water filter and having it delivered c/- the local Post Office as well as other mail. We are even getting a few other small tasks and jobs done. Things like buying a small handle to attach to the end of the bed base to make lifting it easier to access the storage area underneath, something we have been meaning to do for the past three years! Roy has a bit of work on at the moment so he can quietly get on with it. We have managed to catch up with Beryl, my late sister-in-law Ann’s 93 year old mother, and Ann’s brother Frank and will try and see another brother Donald later. 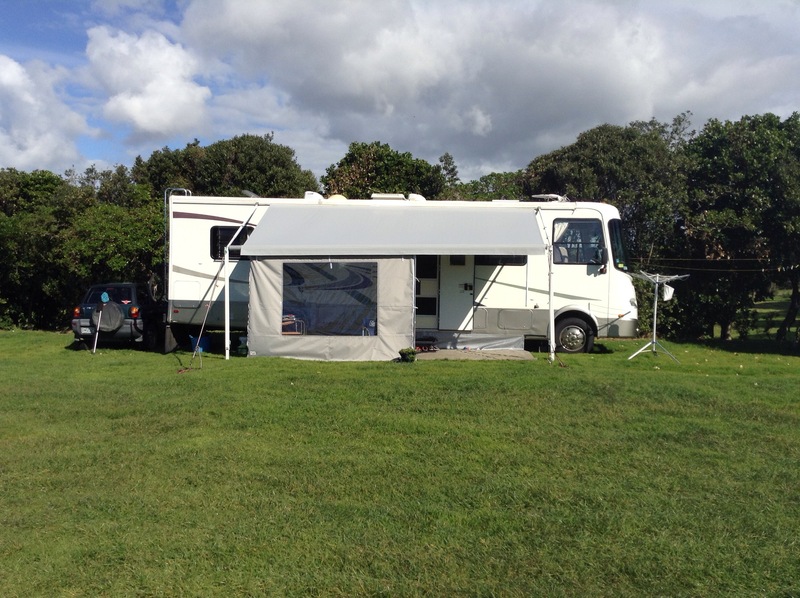 We shall stay here in Kaitaia until Tuesday or Wednesday when we will head out to Matai Bay for a couple of weeks where we have a sneaking suspicion that we may meet up with a few more friends! It was time to leave Kerikeri on Monday, plans were set and we were ready to move on. However, things never quite go to plan or as simply as we would like as we seemed to fluff around for ages. First it was off to the dump station to empty the waste tanks and fill up with water, but the water pressure was soooooo sloooow, it took forever. I left Roy to tend to those matters whilst I nipped into town to; 1. Retrieve a notebook I left at the library 2. Get some cash to pay for the parking 3. Get our copy of the weekly Listener magazine 4. Post off a parcel. That completed, I then met up with Roy who said we were to go to the local franchise of Carter’s Tyres to get the airbag suspension checked and the tyre pressures checked. A 10 minute job turned into an hour. All went well until the man got to the final tyre, and he could not access the pressure valve as it was hidden by the wheel cover. Try as he might, that damn cover would not come off, after much frustration and use of many tools he finally managed to get it off without a scratch. Finally we could head off. But not quite, first off to the petrol station for some fuel, hook on the car and this time we are off! We arrived at Ramp Road and parked ourselves along the beach front and set ourselves up in the sun. We put out the awning as well as the front and side wind shade which made a huge difference, particularly to the temperature inside the van as the door was now sheltered from the wind. It was whilst we were setting ourselves up that Roy came up with a brilliant idea to stop the slight flapping of the front edge of the wind break. When we got all the pieces from the manufacturer, they gave us the half zip that was left over from making. Roy asked me to get out the sewing machine and sew on ties along the edge. That done, he attached the zip to the one on the front and used the ties to attach it to a centre pole. 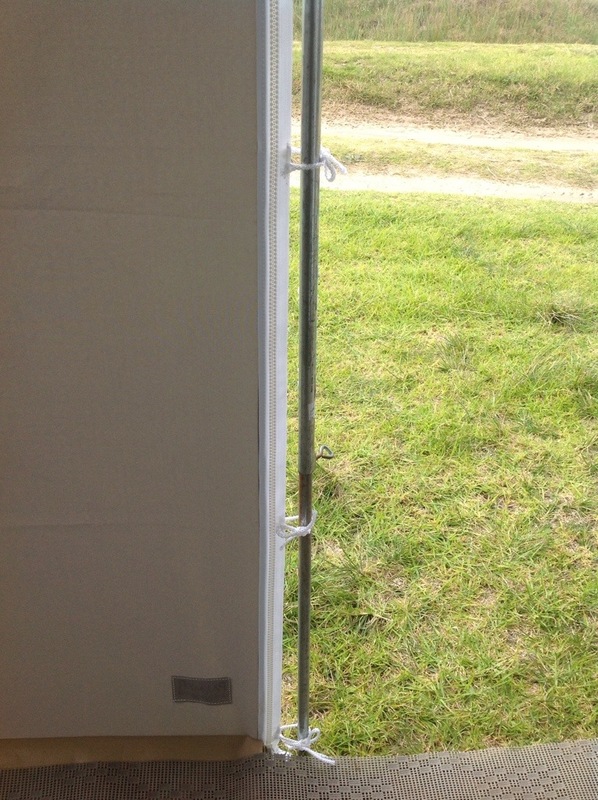 a hole drilled into the awning roll to lock the pole into position and we are set. More tasks on the job list to be ticked off was the cleaning and resealing of joints on the outside of the van. We have a new product to use which seems to be much better than silicone, however, it does tend to be very messy no matter how hard we tried to keep clean. We have black gooey gunk and white gooey gunk ( technical name for Simsons sealant) but first the clean up of the joints, remove old silicone, mask off the area to be done, and get it on as quickly as possible. It turns out we make a pretty damn good team and managed to make a very good job of our first efforts. 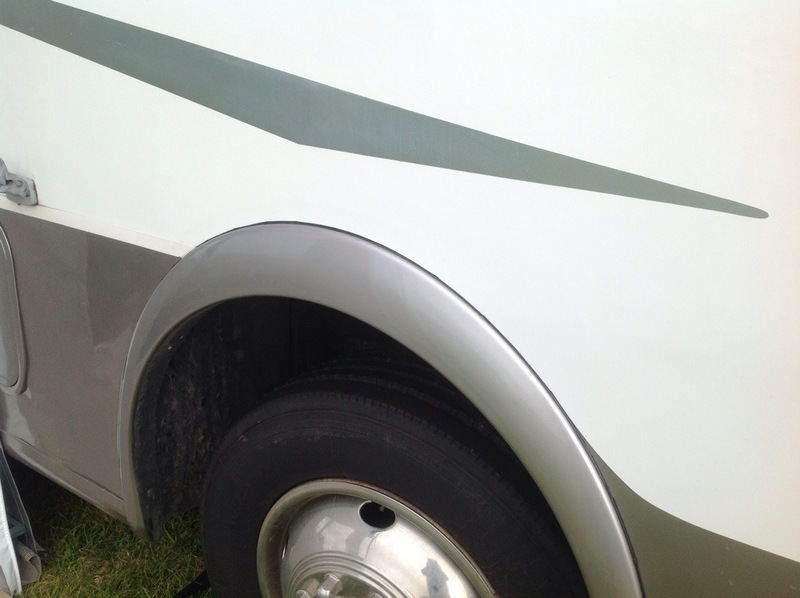 black sealant around the wheel arch. We have a long way to go to complete the whole van, but we can do a little at a time and it will soon get finsihed. During this process I accidentally discovered a way of cleaning and whitening the little locker catches, I removed one to have a go at cleaning it up, as part of the cleaning process (which included the use of a toothbrush -shhhh, don’t tell Roy, I’ll put it back when I’ve finished 😉 ) I made up a solution of a nappy soaking product, left the catch soaking in it for a few hours, lo and behold, it’s nicely clean and white! 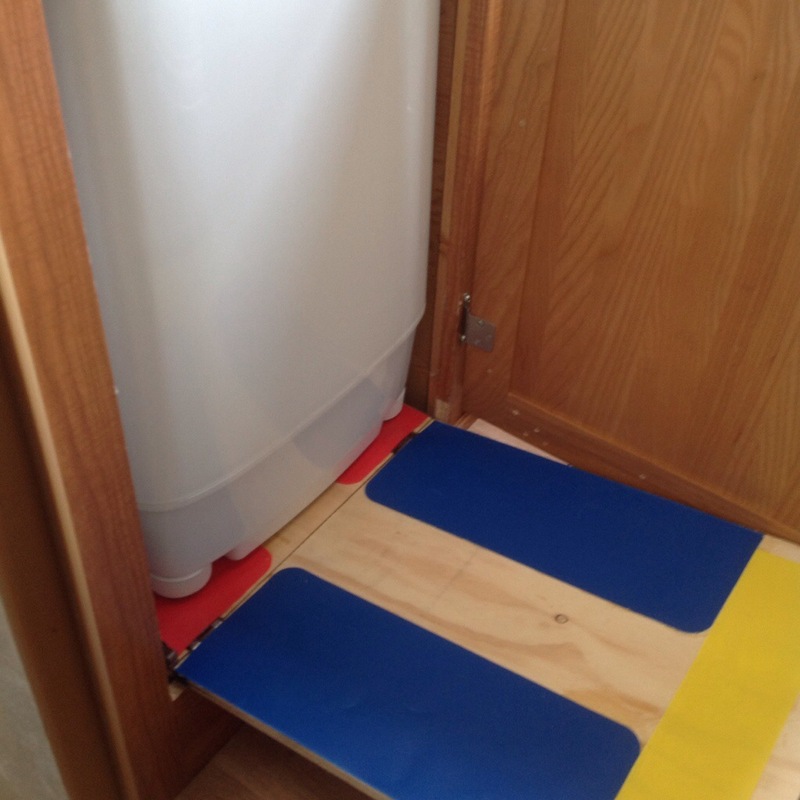 Another we task completed was how to make the access to the washing machine easier. Those who have followed our blog will remember that we installed the machine into a cupboard, but due to size constraints it was a bit of a tight squeeze to get it in and out – read about it here. On talking with friends Brian & Marj, Marj came up with the suggestion of using some of those thin plastic cutting boards placed on the base to slide the machine out. With a bit more thought and experimenting, we have solved our problem, I chopped up a few of the cutting boards as it just so happened that I have a set of them that I don’t use as I don’t like them – they are not good for my knives. So, cut a couple up, glue to the base board, stick the fluffy side of a Velcro dot onto the feet of the washing machine, and hey presto, the machine now slides in and out easily. Sometimes, it is the simple solution that is the best, thanx Marj for sewing the seed. And just to make some of you a little envious, this is the view from the door in the mornings.